I found this hidden gem while washing my car at the Texaco gas station in Miami Beach. I was surprised to the see that the old pseudo-healthy sandwich and juice bar that I was used to seeing, had been replaced with a truly natural, fresh, made from scratch on the spot, nut milkshake bar. In an ice bucket on the counter there was a selection of different types of nut milk: cashew, almond and coconut, in old-fashioned glass milk bottles. Being so jaded from all of the false health food marketing, I was expecting to find an artificial ingredient to ruin it all but was amazed that the milk is made of all natural ingredients and am impressed that they use glass bottles so the milk doesn’t get contaminated with toxic plastic. This is the first time I have seen glass bottles used in a juice bar in Miami. Jugo Fresh, Glaser Farms, Athens Juice Bar and CPR all use plastic bottles for their juices and milks; even Organic Avenue in New York City replaced their glass bottles with biodegradable plastic ones. There is a five dollar bottle deposit to encourage reuse (and of course refill). I ordered a bottle of coconut milk and watched as the mature coconut (from Miami’s hip new coconut company, Coconut Cartel which also supplies their branded coconuts to Soho Beach House and The Standard Spa), was cracked open, separated from its shell and added to a Vitamix blender along with hot filtered water used to extract the coconut milk, Medjool dates, pure maple syrup, vanilla and Himalayan pink salt. The result was a heavenly tasting, fresh, nutritious milk full of healthy fat from the mature coconut. Opened less than two months ago, owners Mario Suarez, Sara Tacher-Suarez and Brittany Fierman started Milk Gone Nuts with a vision to create an old-fashioned milkshake bar with a twist—dairy-free. Sara started making her own nut milks for herself and later her family and friends. When she decided to open her nut milk bar after being encouraged by friends, her daughter Brittany quit her corporate job to help run the business. The three types of nut milk can be ordered by the glass or bottle and made into a variety of milkshake flavours such as green apple and fig or homemade peanut butter and cacao, with different toppings including superfoods like maca, goji berries and chia seeds. Their sister company, Organic Juice Bar, at the same location, makes salads, wraps, pita sandwiches and juices using certified organic fruits and vegetables. Their salad dressings and extras are not natural (and may contain GMOs, e.g. soy, chicken) but along with expanding to more locations, their goal is to become fully organic. 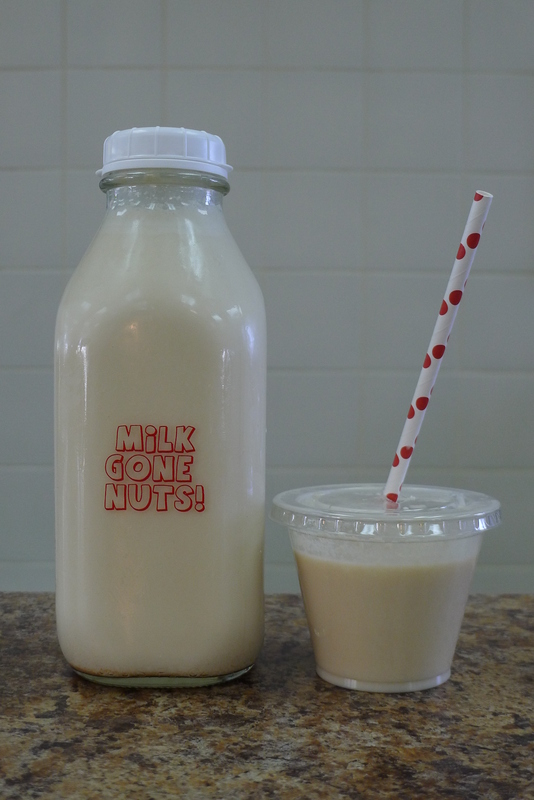 I never expected to find a real food spot in such an unlikely place and I have no doubt, with a unique idea and the only nut milkshake bar that exists, Milk Gone Nuts will become a huge success. Getting my car washed is something I rarely have time for, but now that I can feed my toddler a healthy treat on our way home (saving me the time of making lunch) I will be stopping here more often. Daniela, this looks like a great little place to know about! I sent your post to my brother, who lives in Miami Beach. Great! He should check it out! I didn’t know he lives here, I should meet him sometime. Glad to have found your blog. I am real food lover too. Thanks Nathalia, I’m glad you like it!